Understandably, many homeowners disfavor the coldness of concrete in their home landscapes. Many homes today, however, sit atop concrete foundations. If natural materials such as stone and wood have replaced concrete for sidewalks and patios but that little strip of concrete sandwiched between the ground and the house remains evident, consider facing the foundation with stucco plaster. Take advantage of the broad variety pigments and texture styles to customize the plaster finish to fit the look of your home. 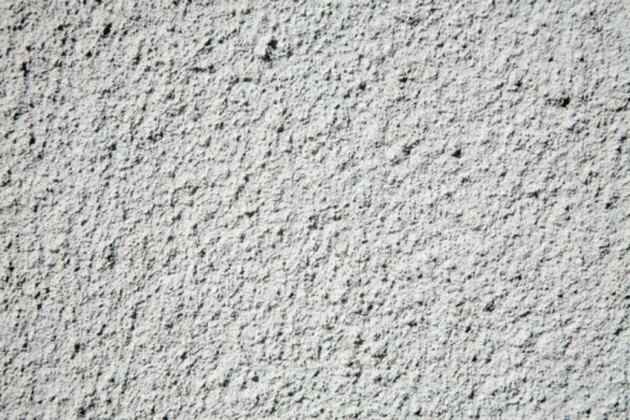 Add texture to a foundation with stucco. Dig out the ground adjacent to the foundation to a depth of at least 4 inches. Wash the foundation thoroughly with eco-friendly concrete cleaner. Scrub the concrete with the cleaner, using a nylon-bristle scrub brush or pressure wash the concrete with the cleaner. Rinse the foundation with water and allow it to dry. Paint the foundation with concrete bonding agent. Allow the bonding agent to dry. Add the stucco dry ingredients to a container such as a large bucket, tub or wheelbarrow. 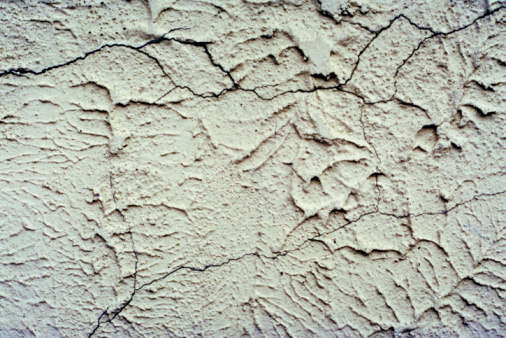 Use a dry plaster pre-mix or blend 3 parts sand with 1 to 1 1/2 parts cement and 1/2 part hydrated lime. Also include any desired pigment powder. Add water to the dry ingredients in gradually increasing increments, mixing them with a shovel until a wet but stiff mortar-like consistency results. Apply a 1/2- to 3/8-inch thick layer of plaster to the wall with a metal trowel. Create the desired surface texture. Options are limitless but include stippling, skip-troweling, sweeping, scratching, scraping, lacing, dashing and stamping. Possible texture tools include trowels, putty knives, brooms, brushes, sponges and sticks. Mist the finished plaster surface with a fine spray of water and cover the foundation with plastic sheeting for a few days while the plaster cures. Spray the plaster with water regularly during the curing process. Paint the plaster with concrete sealer once it has fully cured. Plaster can take up to 60 days to fully cure. Once the sealer dries, return the excavated dirt, covering the bottom edge of the plaster.